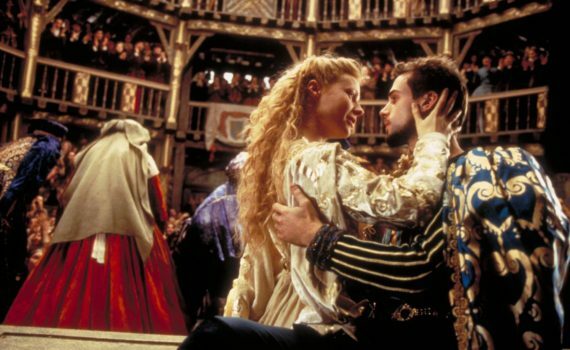 It’s been almost twenty years and perhaps we’ve started to forget a little, but Shakespeare in Love is one of the most awarded/nominated films of all-time. At the Academy Awards alone, it was nominated in thirteen different categories, winning in seven of them. Here’s the full list, and it’s pretty impressive: Picture, Actress, Supporting Actress, Original Screenplay, Art Direction, Costume Design, Music, Supporting Actor, Director, Cinematography, Sound, Editing, Makeup. That’s no small deal, and even considering that not all “awards movies” are worthy, a film that makes this bold a statement is one that’s at least worth a glance. And in this case, the product actually lives up to the hype. Shakespeare as a young man, as an unsuccessful poet, as an artist in search of a muse. Will works for one of two competing theatres in London, the broke one actually, and seems destined to have his words & talent wasted by an unappreciative world and an inability to stay inspired. He’s writing a throwaway play about a boy named Romeo and a pirate’s daughter, a comedy that he knows is drivel. But then a meeting takes place, an encounter that will change his life. Will meets the Lady Viola and falls hopelessly in love, beginning an affair that breaks all the rules of English society. It also inspires him to write like he has never written before, to change his play into a story of star-crossed love, and to ultimately create one of the greatest pieces of literature in history, all while living the plot firsthand. Though the beginning of the film is both choppy and full of way too many characters, the action soon settles down into what makes the movie magical; a great love story that inspired the greatest love story. Yes, it’s all made up, this isn’t how it actually happened, but where’s the fun in history when there’s a romance to be told?! In all seriousness, this is a fictional drama, don’t get hung up in the details. Instead, enjoy the amazing performances all around, from the three huge names mentioned above to the multitude of side characters who make the cast sing: Geoffrey Rush, Tom Wilkinson, Judy Dench, Colin Firth, Jim Carter. These roles, combined with perfect costumes, set against a lavish background, create an unbelievable Elizabethan atmosphere that was made to be brought to the screen. This film deserved its nominations and its wins, it really is that good, and you really should see it right away if somehow you missed it in the 90s.